The portable lead acid battery charger is designed specially for 36v and 30AH (maximal) battery. CC/CV (constant current and constant voltage) charging method assures the battery’s service life, at the same time the battery is charged 100% capacity. It is super easy to use. 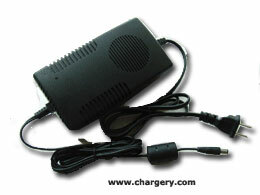 The charger can be plugged directly into a AC 100V-240V outlet and charge your battery. The charging time depends on the battery capacity. Generally, the time(h) is also equal to battery capacity(mAh)/charging current (mA). When the battery pack is full charged, the charger’s LED is automatic from RED to GREEN. C36P is fully committed to compliance with the European Union’s RoHS directive.